Paul Corio at 210 Gallery, installation views. 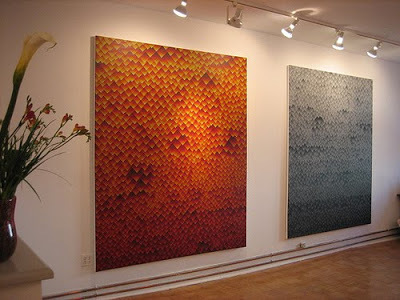 At artcritical.com, Stephen Maine reports that the color in Paul Corio’s paintings is derived from the artist’s analysis of results at the Belmont and Aqueduct tracks, but all you really need to know is right before your eyes. Maine’s description of the pictorial language, particularly Corio’s use of color, are excellent, and he perceptively concludes with the observation that although the paintings may at first seem to present a chilly, retinal experience, the disciplined study of color begets an emotional response—that the supposedly cool play of chroma opens onto imaginative vistas. “While Toga Tiger (and its slightly smaller companion piece, El Don Pepe) are based on shifts in hue, Mr. Hi-Hat (2009) is concerned with intensity, saturation. Overlapping disks, striped with a vibrant red and vigorous cerulean blue, drift in a similarly-striped field in which those colors become progressively neutralized—shifted toward gray—until the difference between them is barely perceptible. From a distance (and in photos) the grays take on a greenish cast. It’s a truly weird phenomenon, and quite wonderful. 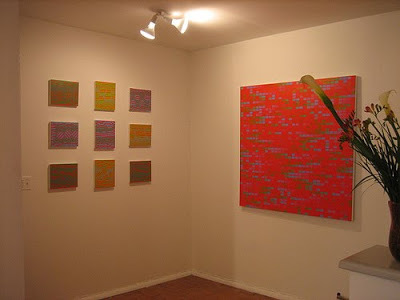 Nine small paintings on panel from 2005 are red/blue, red/green, and orange/green variations on the theme. Each is a zinger, in which Corio’s visual wit is in full effect. While figure (disks) and ground (neutralized murk) are clearly differentiated, each is made of stripes of alternating colors–the ultimate in figure/ground ambiguity. “In the two-foot-square Misterioso (2008), an intertwining circuitry of T and L intersections moves, left to right, through a palette of blue, violet, pink, red, orange, and green; these spectral colors are set against and qualified by a tender, blue-green ground. There are lots of dots. It’s a knockout. Less convincing is MR PC #3, in which the painting’s pixellated treatment resolves into the work’s four-letter title. It recalls stadium scoreboards and transit announcements, but the allusion to commercial graphics seems misplaced, and color relationships take a back seat to issues of linguistic legibility….” Read more. “Paul Corio,” 210 Gallery, Brooklyn, NY. Through February 28, 2010.